Please tell us about your current practice and the types of transactions you typically handle. My practice at Milbank focuses on corporate transactions, primarily acquisitions, finance, securities offerings, real estate and hospitality, and restructurings. My practice also involves corporate governance matters and contracts generally. I’d say my practice involves advising clients in their efforts to either raise money or to spend money. I feel very fortunate to have spent over 20 years at one of the premium law firms in the country. What changes have you experienced in these areas since joining the firm in 1995? Are there any notable trends or has there been an evolution in corporate transactional practice from then to now? The practice continues to become more and more sophisticated, and the clients have become more sophisticated consumers of legal services as well. With technology, and everyone having a smart phone with them 24/7, the practice has become more all-consuming. As a result, I’ve found that those who best succeed at the practice of law either are good at finding a balance in their lives or have a real passion for the work, or both. Clients have developed a better sense of how attorneys assist in achieving their transactional goals. And they are more focused on how to manage their legal spending budget, especially since the economic downturn starting in 2008. What is it that you find most interesting about corporate practice? One of the things that I particularly enjoy about transactional work is that the parties are usually working toward a common goal. If we’re successful, every party to the transaction is better off. Unlike with the work of litigators, the parties are not competing against each other, divided into winners and losers. In fact, many successful corporate transactions are celebrated with a closing dinner or other event, in which the parties, the lawyers, and the other participants share a meal and celebrate their accomplishment—a tradition not typically experienced by our litigation colleagues! What do you like about being an expert witness? In some ways, it’s the culmination of many years of practicing law, combined with some of the related experiences I’ve had over the years, such as teaching, writing, public speaking, and public service on various boards and bar association committees. It provides an opportunity to share and apply my knowledge and experience to assist in the resolution of conflicts. Moreover, it provides new and interesting challenges because the work of an expert is fundamentally different from practicing transactional law. How did your career evolve so that you have had the opportunity to expand into expert witness work? With respect to my expert witness engagements, clients have found me through a variety of different sources, mostly related to the various “extracurricular” activities I’ve been engaged in. Some clients have found me through the faculty directory at UCLA School of Law, where I have been an Adjunct Professor for the past 15 years. Others have found me as a result of my work over the past 5 years as General Editor of Ballantine & Sterling, one of the leading treatises on California corporate law. Others have learned of my specialty expertise in the law governing lawyers due to my work on the California State Bar’s Ethics Committee, including service as Chairman of the Committee. I believe I’m one of few practitioners bringing all of these great experiences into expert witness work. My volunteer work through these sorts of extracurricular activities, and giving back to the community, has been an important part of my career. I find it personally rewarding, and I’m constantly learning from my students and from the articles I write and other works I edit. It turns out that this aspect of my legal career has also led to many of the expert witness engagements I’ve had the pleasure of working on. Is it tough being “on the spot” or being grilled on the stand? I suppose there is something a little unnerving about being grilled, especially when you know that it’s the job of the attorney questioning you to trip you up and discredit your opinions. However, when you’ve done your homework and you know your material, there is something quite satisfying about being able to share that knowledge. And it’s particularly satisfying when testifying in court to be able to assist the trier of fact (whether that’s a judge or jury) in figuring out what happened and what should happen. Tell us about your best and most interesting experiences as an expert witness. Much of the expert witness work I’ve done has involved attorney ethics, corporate governance, or transactional work (such as mergers and acquisitions and securities offerings). One of the first cases I worked on involved an M&A transaction where there was a post-closing dispute as to whether the seller was contractually entitled to an additional purchase price payment (known as an earn-out payment) as a result of a subsequent sale of the acquired business. In my analysis, the key to determining whether this particular seller was owed the money had to do with the structure of the subsequent sale, specifically whether the subsequent sale was a stock sale or an asset sale. For an M&A attorney, the distinction is fairly basic, and in fact is a subject I cover in the course I teach at UCLA School of Law. But what I found, and was actually surprised to discover, was that none of the parties to the dispute, nor their litigation counsel, nor the arbitrator who was to rule on the dispute, understood this fundamental difference. As an expert witness, I was able to add real value to the dispute resolution process by sharing my knowledge and experience. What I have learned since then is that not all disputes are so easily analyzed and resolved, and my subsequent expert engagements involve disputes that require a much more sophisticated analysis. But by bringing my three decades of experience to bear, I feel I can help the trier of fact better sort through these issues. You take a very practical approach in the course you teach at UCLA school of law. Explain what is different about it in comparison to the traditional law classes most of us remember. As an Adjunct Professor at the UCLA School of Law for the past 15 years, I’ve been teaching a course entitled “Lifecycle of a Corporation.” It’s a course of my own design, which focuses on deals, negotiation, contract drafting, and attorney ethics. The course is actually an outgrowth of the training I’ve been involved with at Milbank and is designed to prepare law students for work as a transactional lawyer at a law firm like mine. During the course, I lead the students through the lifecycle of a business of their choosing. As assignments, they develop a business plan and then go through the steps of choosing a business entity, earlystage equity financing, later-stage debt financing, an initial public offering (IPO), then ultimately selling of their business or doing some other exit strategy. This allows the students to track the major cycles of a business from the perspective of the transactional lawyer. We further bring that to life through negotiation and drafting exercises. Essentially, the course enables students to hit the ground running at their first jobs, unlike many other law school courses which take perhaps a more academic or theoretical approach. What’s especially gratifying is that I often hear from former students expressing their appreciation for the training they got in my class and how well it prepared them for their practice. What is the most important message from practice that you like to share with your students? I would say one of the most important lessons to learn in being a good negotiator—a key skill for every transactional lawyer—is to listen. Only by listening, both to your client and to your counterparty, can you better understand and navigate through what might initially appear to be irreconcilably conflicting positions and goals. In preparation for the negotiation exercise that I use in my course, I share with my students an experience I had on behalf of one of my clients in what we thought would be a very difficult negotiation. My client was seeking to terminate or renegotiate a very unfavorable contract and knew it had very little leverage. After spending days strategizing with the client on how to best achieve our goal, I called the lawyer on the other side to launch into my well-prepared argument (although it felt more like a plea). I was more than a little thrown off when she said she was so glad that I called. In fact, so much so that, rather than launch into my prepared speech, I took a breath and instead asked her why she said that. She then shared with me how disadvantageous the contract was to her client, and that they wanted to terminate it as soon as possible. Needless to say, we were able to accommodate that request! In all likelihood, the contract would have ended no matter how I approached that call—but, had I not stopped to really listen, and instead launched into my suggested compromise, I’m convinced my client would have had to pay the significant termination fee that they had authorized me to offer. How did your years of transactional practice help in your role as chairman and member of the California State Bar Ethics Committee? The vast majority of attorneys focused in this area have practices that directly involve attorney ethics, usually as litigators who defend lawyers in malpractice or discipline cases or who prosecute such cases. There are relatively very few corporate lawyers who have developed a specialty in this area. The rules of professional conduct, while of course applicable to all attorneys in all practice areas, sometimes might seem to apply differently to transactional lawyers, at least as a practical matter. For example, with respect to conflicts of interest and the no contact rule, some corporate attorneys, working on friendly deals (those where there’s no winner and no loser), may not fully appreciate that they are adverse to their client’s counterpart, such that there could be a conflict of interest if they also happen to represent the counterpart in some other matter. In such circumstances, the corporate attorney must get the informed consent of one or both of the parties; otherwise, the attorney may be required to terminate one or both engagements. Also, the no contact rule precludes attorneys from communicating with their clients’ counterparts without the consent of the counterparts’ legal counsel. While litigators readily recognize that they have no business communicating with the party on the other side of a lawsuit, corporate attorneys routinely engage in discussions with all of the parties in moving the transaction forward. Again, because the form of adversity is different in a transactional practice, some corporate attorneys may not fully appreciate when and under what circumstances they are permitted to communicate with their client’s counterparts. Coming from a transactional background, I feel I bring a unique perspective and a form of experiential diversity to the ethics bar. What major new rule(s) or guideline(s) were implemented during your tenure on the committee? Probably the biggest developments in ethical issues for attorneys today relate to technology and social media. Attorneys must be much more tech savvy than ever before in order to competently represent their clients, whether it’s with respect to data protection and encryption, use of open access WiFi, or e-discovery (which is the discovery of electronically stored information). Also, the tremendous growth in the use of social media raises all kinds of ethical concerns, such as with respect to public disclosures, the way in which attorneys might connect with opposing parties or members of the jury or even judges, and attorney advertising and solicitation. These technological advancements are occurring faster than the rules can be interpreted or modified to adapt. This is where some of the more interesting developments have occurred in attorney ethics and where some of the biggest challenges lie in front of us. Was your role as general counsel for the Los Angeles Kings hockey team as fun and challenging as it sounds? What were some of the more memorable experiences you had? Working with the Kings was a lot of fun. While I’m not much of a sports fan, I enjoyed being associated with the team. This was only briefly (for about a year), and over 20 years ago, but it was the first time the Kings made it to the Stanley Cup finals, and I fondly recall going to games and traveling with the team. And the seats were great! Any hockey fan will appreciate how exciting it was to sit up at the glass as players were being checked right in front of you! The work was fun too. I got to work on the transaction by which my boss at the time acquired the team, and my ongoing responsibilities included player contracts (including Wayne Gretzky’s) and interaction with the National Hockey League. How long have you been providing editorial supervision and guidance for Ballantine & Sterling: California Corporation Laws, a major, authoritative, LexisNexis publication on corporate practice? What exactly does your editorial role involve? I’ve been the general editor of Ballantine & Sterling: California Corporation Laws for four years now. 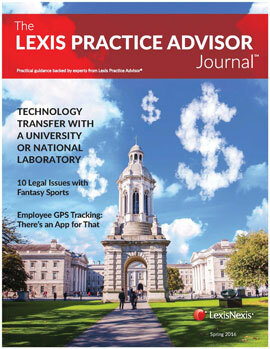 I feel so honored to be associated with this LexisNexis publication. It’s amazing: I understand that this seven-volume treatise on the laws governing businesses in the state of California has been cited as authority in over 500 federal and state court opinions, 25 SEC no-action letters and other administrative reference materials, and 50 law review articles. The staff of LexisNexis and its contributing authors do the bulk of the work in terms of preparing the quarterly updates. My role as editor is to oversee their efforts with respect to the substantive material and to help to ensure that this great resource continues to provide current and practical guidance to practitioners in the state. I could not be more proud to be associated with Ballantine & Sterling: California Corporation Laws. You have held so many interesting positions throughout your career—what would you say has been the most rewarding aspect? It would be hard for me to single out one aspect of my career as being most rewarding. I believe the key to a long and happy career is to love what you do. For me, I’ve been very happy with the broad range of corporate work I’ve been fortunate to be involved with. I’ve also had the opportunity to teach at a major law school, edit a prestigious treatise and write on various interesting topics, and to play a leadership role in the attorney ethics community. And, on top of all of that, and as a result of all of that, I’ve recently been given the opportunity to turn all of that experience into a number of interesting, challenging, and meaningful expert witness engagements. Neil Wertlieb is a partner and member of the corporate group at Milbank, Tweed, Hadley & McCloy. He teaches “Lifecycle of a Corporation” at UCLA Law School. He served on the California State Bar’s Ethics Committee for six years (including one year as chairman) and is the former chairman of the Business Law Section and Corporations Committee of the State Bar of California. He also worked as General Counsel for the Los Angeles Kings Hockey Team. Neil is the editor of Ballantine & Sterling: California Corporation Laws. He is frequently called as an expert witness in matters related to attorney ethics, corporate governance, business financing, mergers and acquisitions, and securities.